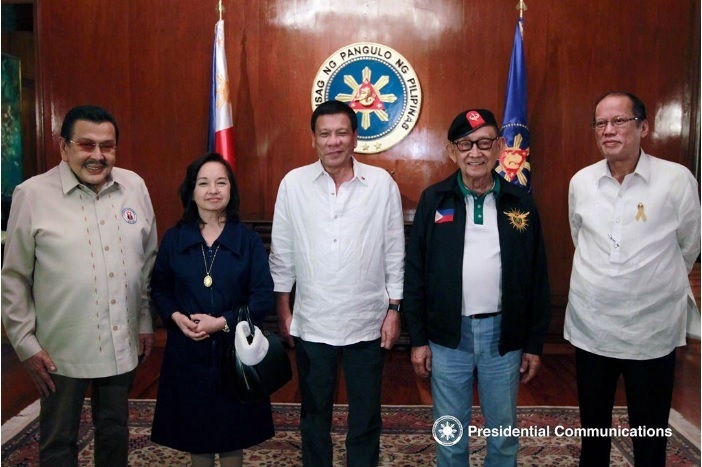 July 27 was a historic day as President Rodrigo Duterte met with former presidents Joseph "Erap" Estrada, Gloria Macapagal-Arroyo, Benigno "Noynoy" Aquino III, and Fidel Ramos for the National Security Council (NSC) meeting held at the State Dining Room of Malacañang. Top officials were also present including VP Leni Robredo, Senate President Aquilino "Koko" Pimentel III, House Speaker Pantaleon Alvarez, majority and minority leaders of Congress, chairs of Senate and House committees and Cabinet members responsible for national security concerns. The NSC, supposedly composed of 35 members in all, was convened by President Duterte to discuss the arbitral tribunal ruling in the West Philippine Sea or South China sea issue. Aside from the Hague ruling, the council also discussed charter change in view of the shift to federalism being proposed by Duterte. Council members were also updated about the current administration's war on illegal drugs and peace and development efforts. Former President Ramos was quoted as saying, "This is the Philippine Team," to describe their group of ex-presidents and incumbent President Duterte. Netizens are saying that Duterte, Ramos, Estrada, Aquino, Macapagal-Arroyo is the country's ultimate D-R-E-A-M team. Ramos recently accepted Duterte's offer to be the country's special envoy to China. Malacañang's press release stated that former DILG Secretary Rafael Alunan, who was also present at the NSC meeting, is being eyed by Duterte to back up Ramos in talks with China.